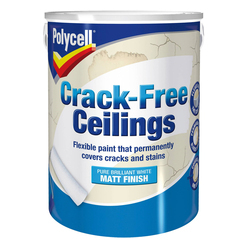 Polycell Crack-Free Ceilings is a great way to restore cracked ceilings to a smooth ‘good as new’ finish. It’s flexible paint formulation uses Polyfilla technology to not only cover cracks but prevent them from reappearing. A smooth and flexible paint, that permanently covers cracks and stains. One coat formulation that prevents cracks from reappearing. Restores cracked ceilings to a smooth ‘as good as new’ finish. Available in Matt and Silk finishes. 1I don’t like my artexed walls & ceilings, I want them to be smooth, – how do I achieve this? Polycell SmoothOver has been formulated to cover over old-fashioned textured surfaces, giving them a smooth finish. It will also cover imperfections and hairline cracks.